Some countries in the Euro are experiencing unusually high current account deficits with the rest of the world. One of the main reasons for the size of the current account deficit is that they are unable to allow their currency to depreciate to restore competitiveness. Both Portugal and Greece have a current account deficit of near 10% of GDP - amongst the highest in the developed world. Other countries struggling include Spain. They have seen a fall in the current account deficit from 10% of GDP in 2008 to over 3.5%. But, this is still high. Ireland has also seen a decline in its current account deficit from 5% of GDP to just a small deficit. However, this has been at the cost of a sharp slowdown in consumer spending on imports. 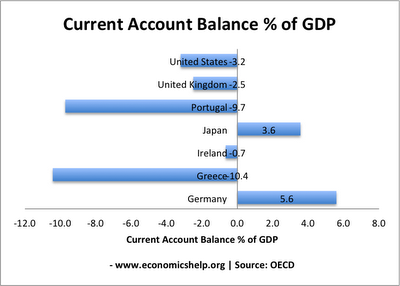 If the UK was in the Euro, we would almost certainly be facing a larger current account deficit. Since the credit crunch hit the UK, the value of sterling has fallen 20%. To some extent demand for UK exports seem quite inelastic (the fall in price hasn't seen a big increase in demand. see: terms of trade in UK) But, if we had been in the stronger Euro, our exports would be less competitive and imports more attractive. Large budget deficits in Greece and Portugal. Demographic factors. A young population tends to consume more. Germany has a relatively older population so tends to consume less and save more, contributing to their current account surplus. Netherlanders an overvalued exchange rate exacerbates these fundamental factors causing a current account deficit. How Else To Reduce Current Account Deficit in the Euro? Wage restraint. Cutting public sector wages and putting downward pressure on private sector wages. Supply side policies to improve competitiveness, e.g. privatisation, more flexible labour markets, deregulation and greater competitiveness. Supply side policies may help in the long term, but in the short term, restoring competitiveness requires a painful period of deflation to slowly improve competitiveness. Of course, this leads to higher unemployment, slower growth and the protests we are seeing in Greece and Spain. Spain has an unemployment rate of 21%, which is almost 45% amongst young workers. This shows that there number one priority should be tackling unemployment, yet the constraints of their current economic situation mean they are pursuing deflationary policies, when really the economy needs the opposite. The euro is not the sole cause of the current account deficit. Other reasons are the large budget deficits in Greece and Portugal.